Bulls are charged up but caution seems to be the buzzword for fund managers. On September 3, the BSE Sensex crossed the 27,000-mark to touch its all-time high of 27,255. Despite this bullishness in the market, Nilesh Shetty, Associate Fund Manager at Quantum Asset Management Company (AMC), has been taking a cautious approach to Indian equities. This is the first time in eight years that Shetty's fund, Quantum Long-Term Equity Fund (QLTE), has been sitting on more than 33 per cent cash. The last time the fund had a huge cash pile was back in November 2010 and January 2011 when it was sitting on more than 20 per cent in cash. "The reason why we are in cash is because most of our stocks have hit the sell limit and we had to exit the stock," says Shetty. "On a two-and-a-half year forward earnings we aren't seeing much of a buy at current levels." Today, the QLTE fund has only 20 stocks in its portfolio, compared to some 30 stocks a year ago. Shetty is now selectively investing in gas and power utility stocks and has exited banking and engineering sectors. "We are picking stocks that will give steady return on equity and will not be highly volatile," says Shetty. Similarly, Chintan Haria, Fund Manager at ICICI Prudential AMC has been booking profits in mid-cap and small-cap stocks and is shifting to a defensive strategy by getting into the large-cap space in select energy, telecom, IT, automobile and FMCG stocks. "From heavily positive a year back, we are now cautious. In the five-and-a-half months since March 2014, we have made a 50 per cent absolute return in mid-cap and small-cap stocks and we realise that such returns are not possible in the next one year, so we are booking profit," says Haria. While fund managers are getting cautious, fund houses are witnessing rekindled retail interest in equity schemes. For instance, UTI Mutual Fund garnered Rs 770 crore in its three-year close-ended UTI Focused Equity Fund - Series I. The amount raised was way above the fund's own expectation of Rs 500 crore. "This signals the revival of the interest of retail investors in the Indian equity market ," says Suraj Kaeley, Group President (Sales & Marketing) at UTI AMC. However, past experience has revealed that small investors always enter the market at high levels. So, with retail money coming in at a time when the Sensex is surging, is there a bubble being created in the market? "It may not be a bubble, but certainly the market is not cheap. Last year was good, but the same returns may not be replicated this year. Therefore, if someone enters thinking that they will make returns like last year they are in for a rude shock," says Haria. The biggest domestic factor driving the stock market is the feel-good factor generated by the Narendra Modi government. The outcome of Modi's overseas visits - to Nepal and Japan - and his seeming ability to win hearts globally have boosted sentiment on Dalal Street. 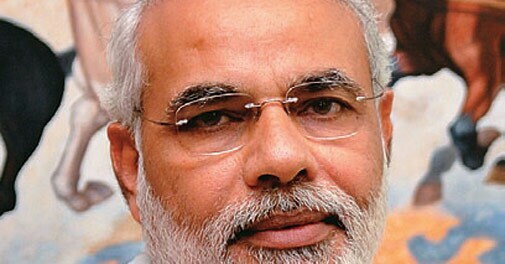 Japan has already committed an investment of $33.5 billion in India. And there is a feeling that Modi's visit to other developed countries will bring in more investment into the country, which augurs well for the economy as well as for the market. There is a perception on Dalal Street that development is the main agenda for this government. It is one of the reasons why mutual funds have been net buyers in equities since the new government came to power. Between May and August, they were net buyers to the extent of Rs 15,500 crore. They were net sellers to the tune of Rs 10,500 crore between January and April. Then, the improving health of the Indian economy has also led to the recent bull run. 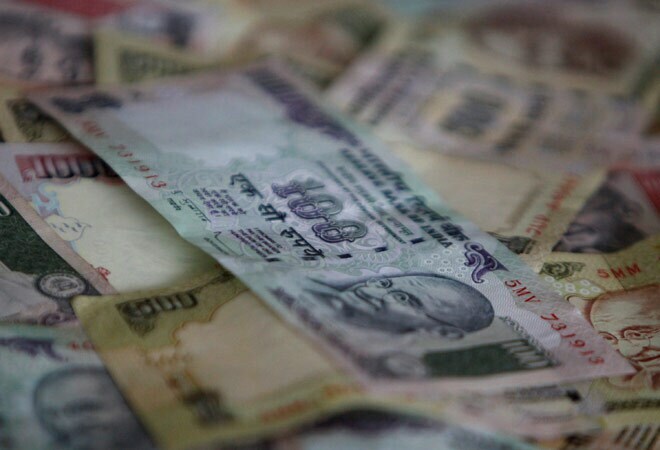 The current account deficit is narrowing and inflation is easing. Also, the rupee is stronger and oil prices have come down. 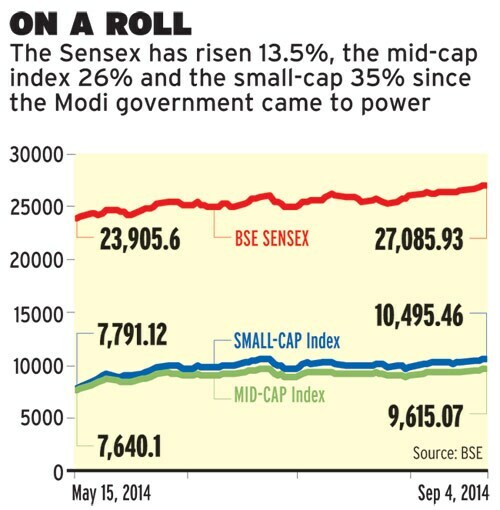 The biggest local factor driving the stock market is the feel-good factor generated by the Modi government. The main reason for the market's rapid rise has been the sustained flow of funds from foreign institutional investors (FIIs). So far in the past eight months, foreigners have pumped in $13.4 billion into Indian equities. Of this, $6.2 billion came in after May 16, when the new government came to power. As long as FII money will continue to flow into Indian stocks, the equity market is likely to remain buoyant. "There are more positives than negatives. With equities under-owned and other asset classes like gold underperforming, there is a high possibility that investors may rush into equity," says Haria of ICICI Prudential AMC. "Getting carried away is easy in today's market but investors should enter the market with guarded optimism as the rate of increase in stock prices has come down." Agrees Shetty of Quantum AMC. "We have told investors to break their investment plan. If they plan to invest Rs 100, we have told them to invest only Rs 40 at these levels." For the market to have legs, India Inc will require to deliver impressive performance quarter after quarter. While the momentum is pushing the market to new highs, investors should be careful and stick to companies that have a strong balance sheet. Quality is key at current levels because even if the market corrects sharply, it would prevent a sharp erosion in the value of an investor'sportfolio, who would also be the first to recover after a dip. Above all, investors should also check the valuations and level at which they are getting into a stock - timing is key for gaining from an investment in the equity market.